The V-ZON by Coby is portable digital entertainment at it's best! With this ultra-portable DVD/CD/MP3 player, no matter where your family adventures may take you, you can now bring entertainment along for the ride! 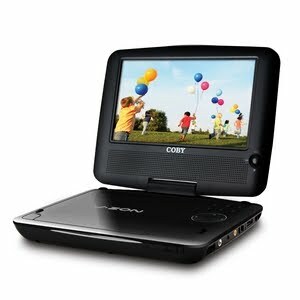 The Coby TFDVD7379 7" Portable DVD Player with DivX® playback gives you options for your portable DVD-playing needs. Its compact design features a swivel screen with 180-degree display and the capability of playing DivX® and digital audio, video, and photo files directly from USB drives and SD cards. Enjoy private listening with the available headphone jack. As you've probably heard me mention many times - we are not a family that is stationary often. If we're not on the road on some adventure, we're traveling back ad forth from our home in the suburbs, to NYC ( we split our time between two residences for work purposes), so we log ton's of time in the car! What's this mean for the kiddo's and us? Lot's of "Are we there yet's" ? How excited was I when the Coby V-ZON arrived?! I immediatly installed it in the car for our next road trip.....and what a pleasant trip it was! Seriously, not a peep out of them! As they watched one of their favorite movies, we peacefully drove from our home to our destination over an hour away;). What I love about the design of the Coby V-ZON, is it's swivel capability ( or you can flip the screen to a "tablet" like position and strap it into a handy case that attaches to the back of the headrest ( sold separately - this is how I chose to set it up in the car). Both children can view the player easily, and with the parent lock I don't have to worry that they'll play with the button to get the DVD out while I'm driving (after all they're still young and want to figure out how everything "works"). With the included car adapter, and A/C adapters, we can also easily take it from the car to watch while on vacation ( allowing the kids to watch their programing without monopolizing the TV). I have even used it at home at my desk to watch a movie while getting some work done. The convenience and portability, coupled with great features and a crystal clear picture is great for families on the go. With school back in session, bring along the Coby V-ZON to watch your favorite DVD while waiting in the carpool lane, or for the kiddo's at sports/music practices! BUY IT: You can find the Coby V-ZON 7" Widescreen Portable DVD/CD/MP3 player with DivX® at a retailer near you.